The Drager HPS® 3500 - a multifunctional and universal helmet for the diverse requirements of rescue teams during search and rescue, forest and bush fire fighting, traffic accidents, rescue from heights, water rescue and any kind of technical assistance. Technologically high quality materials offer optimum protection due to high mechanical durability - with very low weight. The extremely robust helmet shell in painted or mass dyed/unpainted version from high quality thermoplastic offers a high level of comprehensive head protection. With its modern design and construction the helmet is ideally suited for forest and large-scale fire fighting (EN 16471:2014), technical assistance (EN 16473:2014), rescue from heights (EN 12492:2012) and water rescue (EN 1385:2012). Excellent wearing comfort is achieved through the comfortable interior fitting with 4-point harness including padding of the entire head area. The chin strap is secured with a quick-release buckle and chin piece and can be easily adjusted using Velcro fasteners. The adjusting wheel, which can also be easily reached and operated with gloves, allows adjustment for individual head sizes without having to remove the helmet. 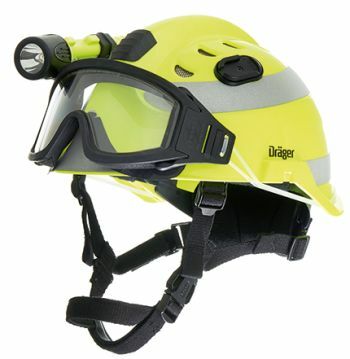 The Drager HPS 3500 features a ventilation system ensuring an optimum climate inside the helmet. To prevent water, sparks and metal chips from entering, it can be closed if necessary. The internal helmet components are made from skin-friendly materials which are anti-allergic, sweat-repellent and breathable. The tight-fitting protective goggles from fire-resistant material supplied with the Drager HPS 3500 set are approved in accordance with EN 166 and EN 14458. The frame of the goggles is made from polyurethane and combines ergonomic design with excellent wearing comfort. The protective goggles feature passive rear ventilation and are optimally protected against fogging and scratching by the modern, polycarbonate antiscratch double glazing (Pinlock®-system). The protective goggles can be adapted to the helmet using a silicone strap (included as standard with the HPS 3500 set) or optionally as separate protective goggles with adjustable elastic strap. With a multitude of optional accessories the Drager HPS 3500 becomes a helmet for various applications. The safe adaptation of visors and ear protection systems to the helmet is made possible by a multifunctional adapter. For the wide range of deployment options special goggles, PC- and wire mesh visors and visors for working on electrical equipment are available. Other accessory components include helmet lamps, ear muffs, neck protection from fire-resistant Nomex® material and various reflective stripes.